If a runner scores, put a circle at the bottom of the box, and inside the circle put the symbol of the play and/or the player that drove him in. For example, if the No. 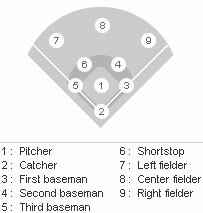 5 hitter drives in two runs with a single, mark his single in the bottom right of his box and mark a circle with the number "5" in it in the boxes of the runners who score (Some people like to use uniform numbers here, so you can tell who did what, even after lineup changes). 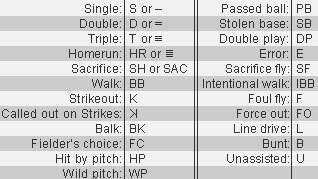 At the end of each inning, total the hits and runs for that inning only. 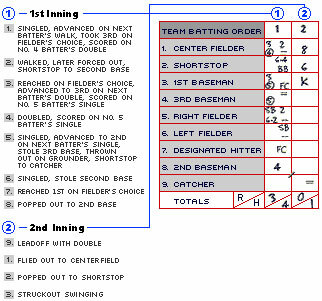 At the end of the game you'll be able to add the innings total to get the game score.